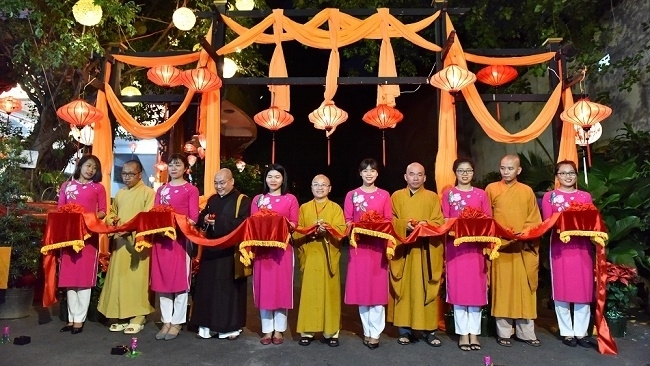 A Buddhist culture week opened on August 21 at the Pho Quang Temple in Ho Chi Minh City on the occasion of the upcoming Ullambana Festival which falls on the 15th day of the seventh lunar month. The program includes an exhibition of Buddhist arts, a trade fair of Buddhist articles and a vegetarian food fair. The exhibition features nearly 500 Buddhism-themed pictures, calligraphies and sculptures while the culture fair features 31 booths displaying Buddhist cultural items such as scriptures, books, sermon recordings and statues of Buddhist deities. Articles associated with Buddhist life such as incense, lamps and tea are also on display. Meanwhile, the vegetarian food fete consists of 18 kiosks featuring a wide variety of vegetarian selections from throughout the country. Originally a Buddhist festival, Ullambana, known as Vu Lan in Vietnamese, has now grown to become a popular cultural celebration when people expressing gratitude to their parents, stated the Most Venerable Thich Nhat Tu. He stated that the festival encourages the people to show gratefulness to those who have given favours, including parents, teachers and mentors, the nation’s forefathers and human beings themselves. The Buddhist culture week is an opportunity to introduce to Buddhist adherents and the public a tangible Buddhist and non-tangible cultural experience, helping to safeguard and promote fine Buddhist values in daily life. The Buddhist culture week will last until September 5.